Wherever you blog at, blogger or WordPress. you need a contact form to connect with your readers. So, Basically We all need contact forms. To be more precise Contact form/page is a must for a blog. For Blogger Platform, There is no reason to ask. Only the default blogger contact form and some other free services are the option. (Which doesn't have many features or fulfill our needs) Also Now-a-days I frequently receive at-least one or two mails/month regarding contact form suggestion for blogger. I found it awesome, As an ultimate solution for contact forms. How can we use FormGet? How to Create Forms Using FormGet? 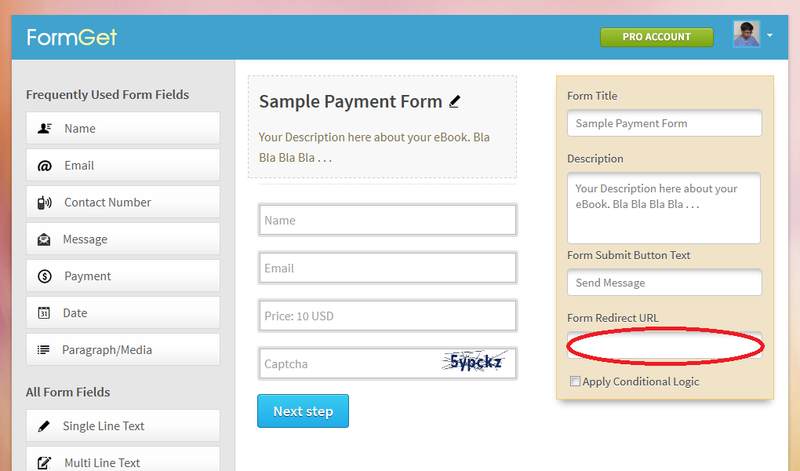 How to Collect Payment via Forms? How to Generate Email Leads using Email Integration Module? How to Add FormGet To your Site? 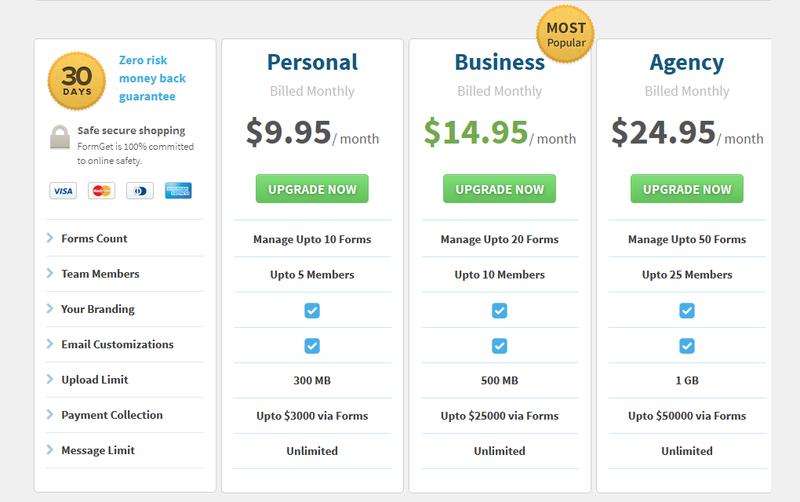 What makes FormGet Unique (Ultimate) from other online form builders? You may ask that, :) Let me explain you one of the main feature FormGet Offer, Can you ever find an easy to use drag and drop contact form which can collects payments even if you don't Know anything about coding. Yes, you heard me right? You don't need to have any technical knowledge to use FormGet, You can use it to collect payments, leads or just use it as a contact form. Now you may wondering "Just, what exactly can FormGet do for me?" Just keep reading I'll explain all main features and How can you use it? Before Checking its features let me give you a short proper explanation about FormGet. FormGet is an Online Form Building Tool. It helps you to create and share any kind of forms instantly. Even if you dont own a website, you can simply create forms and share the url with your users. So owning a website is not at all necessary. FormGet makes it all easy for you. Check out the following Intro video to learn more. Ah! Here we are. Let me Explain the Awesome Features of FormGet. 1) Easy To Use Interface: You can manage multiple forms in one place. Collecting data made easy and you can also track your form visitors and get the data like their past conversation with your support team, point of contact, country name, IP Address, Operating System etc. 2) Drag And Drop Form Builder: Form building made easy, Get ready with your form in a few clicks with an super easy drag & drop interface. Within few minutes your form is ready. 3) Secured Payment Collecting Module: FormGet allows you to easily collect payments from your clients without any issue of loss in the medium. 4) Assigning Task Among Team: You can assign your team members to handle the task more effectively and quickly. 5) Powerful HelpDesk Tool: FormGet has a fast and dynamic helpdesk system. You can do real-time conversation with your prospects with its instant messaging tool. So, if it’s about solving out your clients issues, you can response them faster and quicker. 6) Email Integration: Supercharge your Email Marketing Strategies in a simpler and faster manner. FormGet has integrated powerful email marketing solutions like MailChimp, Aweber, etc. Now we can generate email lead data through contact forms. We can use FormGet in many ways some of them are as follows. To Make Different Types of Forms. To Generate Leads Using Email Integration Module. 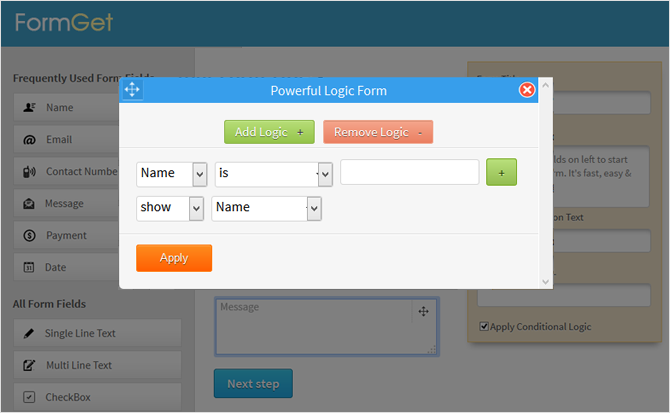 Check out the following video to know how to create a form using FormGet. After Watching the above two videos, Now you should have a clear idea on how to create a form using FormGet. Lets move to another Awesome Feature of FormGet, Collecting Payment via Forms. Soon, They're planning to launch Stripe payment option, So that your client can send payment through credit card. For Example: Assume you're selling an eBook(Worth $10) on your blog. Now let me show you how easily can we create a payment collection form. Just follow the same instruction which you followed to create a normal form (Shown in the above video). After that all you have to do is the following two steps. Adding Redirection link: This is where your reader/buyer will be redirected after making payment (i.e. eBook Download Page). 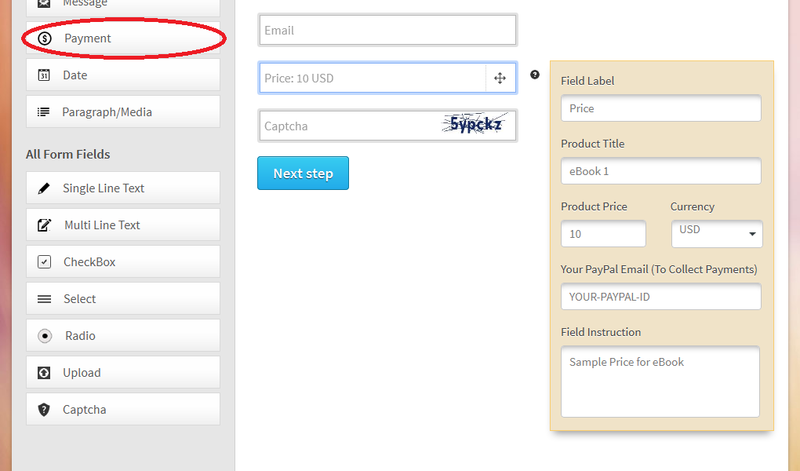 Adding Payment Option: Just click the "Payment" option of the left side of the menu as shown in the image below. Product Title: Add Your Product Title Here. As For this example I used "eBook 1" as Product title. You can use the name of your eBook for product title. Field Information: This field is to enter any instructions to the users/buyers. It'll appear when they click the question mark (?) beside the form field. Wait.. wait.. That's not all. What if you've two or three eBooks and wish to sell it using FormGet? You can use a powerful feature called conditional logic. To set conditional logic just tick the check box Named "Apply Conditional Logic" Which can be found below the "Form Redirect Option". Conditional Logic will help you to apply different prices for different Products. In any Online business Email Marketing Plays a significant role. So, Generating Leads is an Important factor. You can Integrate your Email marketing solution with your form in just 3 simple steps. Step #1 – Click on Setting of the form which you wish to generate leads from. Step #2 – Click on Integration >> API integration, Now You will then have the list of supported email marketing platforms. Step #3 – After that You can select your email Marketing platform and integrate their API with your form. For more detailed explanation check out the video to Know more about "How to integrate you from with MailChimp?" With FormGet Adding Forms To our site/blog is really Easy. To add a form to your site, Go to Dashboard > Click the "Embed Form" button on the form which you want to add on your blog. It'll redirect you to Embed option page. 1) Sliding Form: By using Sliding form you can create an on-click slide contact form on the bottom, left or right side of the page, All you need to do is just paste the embedding code between opening and closing <head> tag. 2) Embed Form on your site/blog: This is the Method I'm currently using to show the contact form on my contact page. To add form using this Option all you need to do is copy the iframe code and place it where you want to show the form. 3) WordPress Shortcode: If You're blogging on WordPress, Then this option is for you. Just Install the Free FormGet WordPress Plugin and follow the instructions to add the contact for as your wish. 4) Direct Form Link: You don't have a website but still want to use the contact form no problem, Just grab the direct link and use it, Check the live demo for better understanding. If you buy it for yearly billing, you can save 20% to 30%. Actually, There are many other awesome feature apart from this, It's not possible to cover all the available features of FormGet in a single review article. Still I tried my best to cover all important features of this form builder. Just check out the features page to learn about it's feature, Also There is a bundle of tutorial videos available to help you get started. Now, It's upto you to Decide, Let me know what you think about FormGet Online Form Builder. If you've already used FormGet Kindly share your experience about it with me. Awesome Blog - Your Tips and Tricks are well written and i also made my blog Seo Friendly and good design after reading your posts and i am regular reader of your blog sir. Thanks for this helping post. I was searching for proper mean to contact with my readers this is awesome. I recommended it for all bloggers. You are great professional blogger. There is no nonsense in your posts. Your templates are also superb and free. We are waiting . . . This blog has become useless nowadays. No new posts, nothing. Chandeep is no longer here. I understand your disappointment, but I have my own reasons for not posting. That doesn't mean there'll be no new posts in future.